If you’d like to replace a single tooth, several teeth or all teeth, dental implants are available at St Clair Dental to achieve your smile goals. They’re the most advanced solution that functions and looks just like a natural tooth. Implants can also be used to anchor complete or partial dentures, as well as bridges. 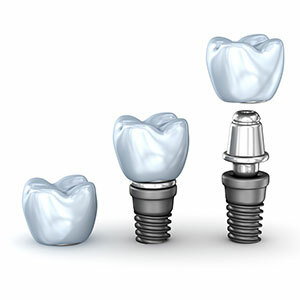 Single tooth replacement with dental implants involves a crown affixed to the implant. We suggest you come in for a consultation that will allow you to find out if you’re a candidate for dental implants. If so, the process involves the placement of the implant to the jawbone while you’re kept comfortable under IV sedation or local anaesthetic. Your oral surgeon or implantologist handles this part of the process. Once a healing period has passed, we can place the restoration or device on the implant. Contact us today to discuss achieving the smile you’ve always wanted! We’re here for you on Saturdays to fit dental care into your busy schedule.